Champions Manchester City host Wolverhampton Wanderers at the Etihad Stadium as the Blues look to reduce Liverpool's lead at the top to four points. After putting seven past Rotherham in the F.A. Cup and nine past Burton Albion in the Carabao Cup, Manchester City will be hoping to translate their free-scoring run into the league when they take on Nuno Espirito Santo's side on Monday night. However, Wolves will prove no pushover after conceding just five goals in their last five Premier League games. Both teams will be on the hunt for all three points as Guardiola's side looks to regain the four-point deficit between them and Liverpool after the Reds extended the difference to seven with a 1-0 win over Brighton on Saturday. For Wolves, a win would take Nuno's side back into the top half of the table after slipping out due to this weekend's results. City's last outing was one to remember after they recorded their highest ever win at the Etihad as they battered League One side, Burton Albion 9-0 in the first leg of the Carabao Cup semi-final. Wolves also recorded a memorable victory in their last game as they defeated Premier League table toppers, Liverpool 2-1 at Molineux in the F.A. Cup fourth Round, knocking Klopp's side out of the famous competition for the second time in three seasons. The last time the two sides locked horns resulted in a point a iece as a 1-1 draw was played out at Molineux back in August. 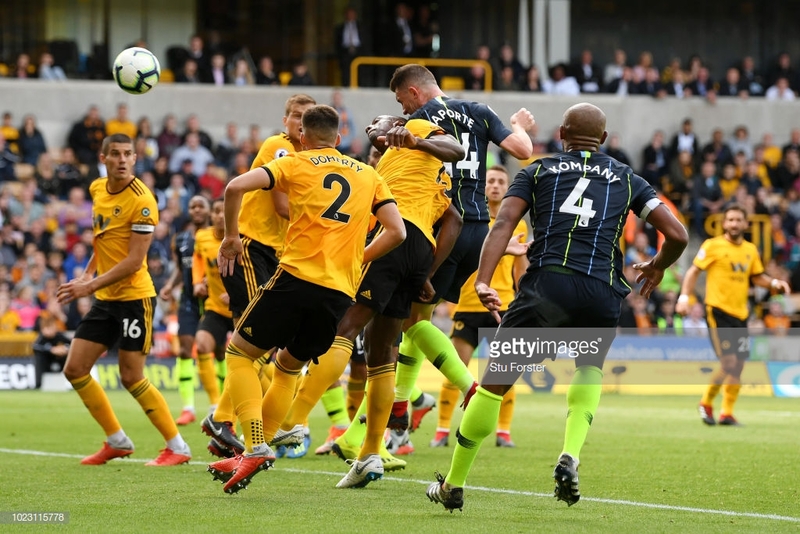 The game wasn't short of controversy as Wolves opened the scoring courtesy of Willy Boly who looked to handle the ball when finishing past City shot stopper, Ederson. Fortunately for the Blues they did save a point as Aymeric Laporte's first goal in a City shirt ensured they didn't head back to Manchester empty handed. In a team full of superstars the one Wolves may have to watch a little closer is David Silva. 'El Mago' has been in splendid form this term after adding goals to his already impressive game, with six league goals this season. Silva is set to become City's most capped player in the Premier League as an appearance in Monday's clash would surpass the current holder, Joe Hart who appeared 267 times in a City shirt in the league. The visitors' main man on Monday evening is sure to be young Portuguese star, Ruben Neves. The 21-year-old has been at the heart of Wolves' recent successes for the past season and a half, and a wonder strike against Liverpool is sure to give the midfielder even more confidence going into Monday evening's clash. City are set to be given a huge boost with the return of top goalscorer, Sergio Aguero and captain, Vincent Kompany expected after missing Wednesday's Carabao Cup clash through illness and injury. As expected, long term absentees Benjamin Mendy and Claudio Bravo are both ruled out of Monday's meeting. Wolves have no major absentees, as Nuno has the luxury of a fully fit first team squad. Usual first teamers Rui Patricio and Matt Doherty are set to return after both were rested for last week's F.A. Cup win over Liverpool.